I have only just found these over in LJ, couresy of Dollface _UK. Bless the heart of that man.he even makes friends with a stinking spitting camel! Awww.. How sweet and cute! Orlando seems to be at ease with every kind of animals. And he geninely cares about them. Thank you Lena, for posting these gems. They truly are gems. Showing the loving heart that our Dear One has. And the camel seems to like him too - notice how it is leaning in to his caress. Would that be because of the "chaps" effect of his chain mail trousers? Just too cute. Not only is the man kind to his fans but also to his non-human fans. CC, I would be leaning too if I was being patted on the head by The Pretty. Just look at that camel's toothy-grin. Thank you for posting those. I'll have to add them to my Orlando with animals collection (which is getting big). I love the way that he's wearing it with such nonchalance as though it's perfectly normal to be wearing a chain mail helmet and trousers in the middle of the desert in the 21st century. Gotta admire the man's style! I thought they looked a little bit like garters. and I finally understood what it is men like about garters. Only Orlando could inspire these sentiments upon viewing him interacting with a camel. What a lovely, lovely man he must be. Donna, I thought of you when I saw these! Could he be any more tender with that camel? I did not really notice the camel though until the second pic. Mind elsewhere. These are great Lena. Thanks a bunch! Likes her movie stars MOME style! That is one smart camel. Leaning in towards Orlando. Welll, its probably a female camel.. don't you think? Is there anyone or anything he can't charm?!! Thanks for the pics, Lena. Oh dear! I am too busy looking at those pants. They are wild aren't they? 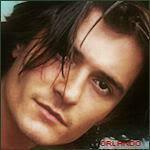 You can definitely tell Orlando has a soft spot for animals of all kind. What camel? There's a camel? Thanks for sharing those with us! Gosh, he really loves all animals, doesn't he? He has such a sweet smile on his face, and so does the camel! And as for the pants and the rest of his costume, umm, well... oh never mind! But I must leave a comment about his arms: yowza! Look at those guns! Oh my, oh my. I sure am slipping fast. Now I'm jealous of a CAMEL! :lmao: Those pictures are great! So glad you are enjoying the pics. I resisted posting this one in case it sent you all to The Gutter. But as you seem to be going that way any way. Sorry PEFICS. Thay made me do it! I wonder if in some future DVD we will see footage of him kissing the camel like the footage on the ROTK EE DVD of him kissing Percy the horse. Well.the camel got a big grin on its face.it must be a she.